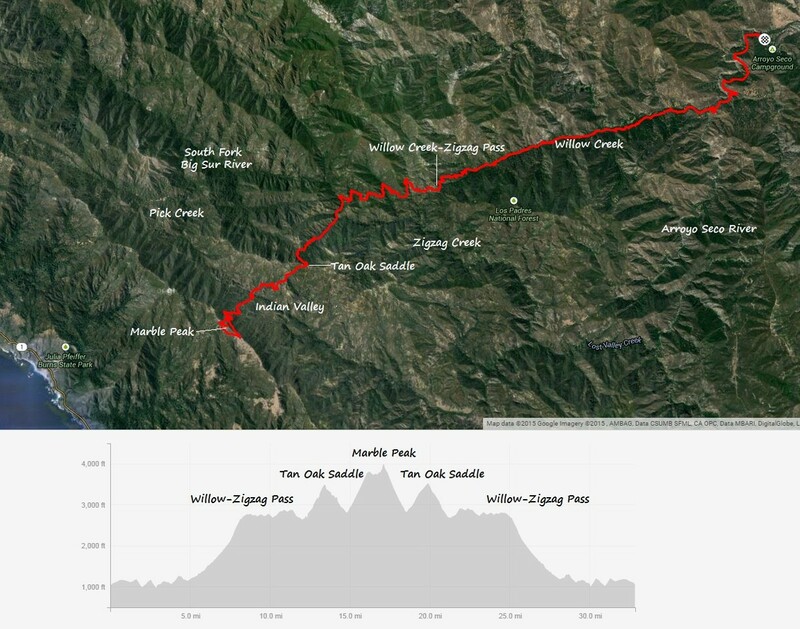 The Marble Peak 50k+ is another Ventana Wilderness classic. The Marble Peak Trail always looked like an intriguing way to go from the depths of the Arroyo Seco Gorge to Coast Ridge at Marble Peak. However, until recently an important section of the trail had been extremely difficult with heavy brush and copious blowdowns. Thanks to several years of trail work by project leader Betsy and volunteers with the Ventana Wilderness Alliance this awesome trans-Ventana trail is now passable from start to finish, and this trail will likely improve more in the near future. Parts of the Marble Peak Trail are very runnable, but overall it’s still an arduous outing you’d expect from the Ventana Wilderness backcountry. In addition to the usual brushy sections there is likely to be numerous blowdowns of burnt snags. As we passed we tried to remove little branches to make the blowdowns easier to navigate. Water was flowing everywhere resulting in some wet stream crossings throughout the route but the trail itself drains very well with hardly any mud despite a foot of rain on coast ridge in the past week before our outing. Rainfall the prior day produced a magical and ethereal experience in the morning with fog layers in the canyons and also hovering on the peaks. The normally dry eastside was surprisingly lush as even the chaparral hillsides were a verdant green. One of the highlights was meeting project leader Betsy with 2 miles to go by coincidence. It was awesome to thank her personally for the tremendous effort that went into rehabilitating this trail and making this type of run possible. GPS route here. The route starts along a 2.4 mile stretch of the Arroyo-Seco Indians road from Escondido Camp to the Marble Peak Trailhead. This stretch of dirt road is permanently closed and it has some excellent views looking into the lower part of the Arroyo Seco gorge. The Marble Peak Trail descends to the Arroyo Seco where a bridge crosses the river and then enters the Tassajara Creek drainage staying on the south side of the creek all the way to Tassajara Creek Camp. This is a lovely stretch of single track through oak woodland and pine trees. At Tassajara Creek Camp, Tassajara Creek and Willow Creek split with the Marble Peak trail following Willow Creek. Soon after, the trail begins crossing back and forth along the creek in a lush riparian zone of ferns, alders, madrones and sycamores. The crossings were wet after rains, but would be dry crossings most of the year as the drainage is not huge. At the head of the canyon, the trail begins an ascent to the Willow-Zigzag Saddle passing through some tall Coulter Pines before emerging into chaparral. Views down Willow Creek are fantastic near this saddle. On the Zigzag side of the saddle, the trail does not descend much into the drainage, instead traversing the chaparal hillsides through several tributaries of Zigzag Creek including Camp Creek and Shovel Handle Creek. This strech of trail is in remarkably good shape with little brush or obstructions. The trail ultimately descends to the Strawberry Valley and the upper reaches of Zigzag Creek, where it follows downstream for a short section before turning up Tan Oak Creek. The Tan Oak drainage was heavily burned in the 2008 Basin Complex fires resulting in thousands of burnt snags. Unfortunately, many of these snags are still standing but prone to toppling over in wind events. The trail also follows the stream corridor, which is a habitat ripe for explosive chaparral growth. This stretch of trail was once extremely difficult, but the trail crews with the Ventana Wilderness Alliance have made it much easier. The trail gains elevation and passes through a pass between Tan Oak Creek and the upper reaches of the South Fork Big Sur River. This pass has a lovely view looking down the South Fork Big Sur River including Ventana Double Cone in the distance. Instead of crossing over this pass, the trail switchbacks up the hill to a high ridge saddle between Tan Oak Creek and Indian Valley. At this high saddle, the trail begins a long descent into beautiful Indian Valley, with its meadows and pines. From Indian Valley is the final climb up to Marble Peak. A small loop can be made around Marble Peak by utilizing the Coast Ridge road and the Marble Peak usetrail. The views from Marble Peak are wonderful and include the Paciifc Ocean, Cone Peak, Ventana Double Cone, Lost Valley and many other points of interest in the Ventana Wilderness. The Marble Peak highpoint makes for a very nice destination at the turnaround point before the return trip to Arroyo Seco. The return trip is mostly downhill with the largest climb being an 800 foot climb out Indian Valley to the Tan Oak-Indian Valley. Have you switched to Hoka? LOL! As a Big Sur native, may I just say you really took the long way!